This year’s event, Nu Skin LIVE!, was a packed series of events that ran from Oct. 10-13. It began with tours of the company’s Provo, Utah headquarters on Tuesday, kicked into high gear with the “Force for Good Gala” and Maroon 5 concert on Wednesday evening, and didn’t slow down until the last note of the Hans Zimmer concert on Friday night. The event required a solid production company. EVI’s experience producing world-class live events and Chicago-based Lightswitch, a consortium of lighting, media, and visual designers, were up to the task. The project encompassed four shows in one at the Vivint Smart Home Arena in Salt Lake City. Wednesday was the fundraising awards gala for the charitable organization Force For Good. Following the private event, they expanded attendance for an arena concert by Maroon 5. A somewhat more traditional business meeting session was held on Thursday afternoon, followed by the a “Nu Skin’s Got Talent” showcase that evening. 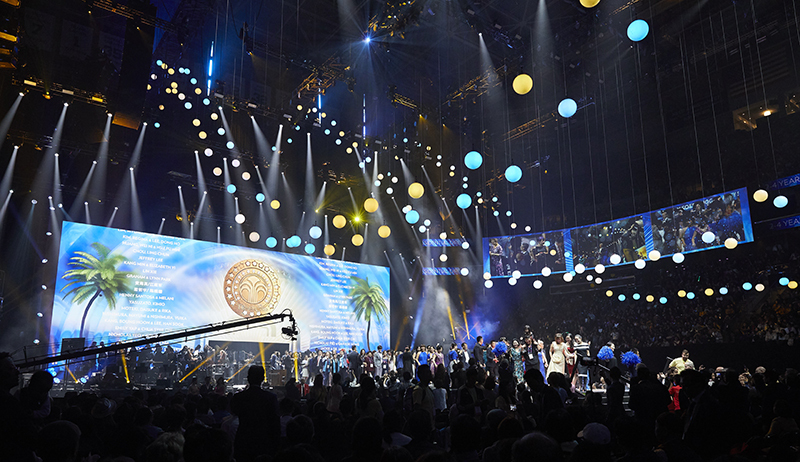 Featherstone describes it as “a global talent search throughout the whole enterprise.” The final night featured a custom concert by Hans Zimmer backed by the Salt Lake Symphony Orchestra and members of the Mormon Tabernacle Choir, followed by an awards presentation. “Each large event needed their own look, feel, and personality.” explains Featherstone. “It was successful because it really checked all the boxes for each show individually as well as having a cohesive and coherent whole.” Of course, this whole production did not come together overnight. Lightswitch began work on this year’s event shortly after the last one. He estimates that it was a 20-month design process. The main LED screen for the Nu Skin event was a 4K, 80-by-30-foot Barco C5 LED wall, with five movable doors within the wall for entrances. The LED thrust/walkway that led onto the floor was 46 feet long. Two long curved projection screens hung on either side of the arena. “The video wall was the stone in the pond where everything rippled out from,” John says. “We used that as our anchor.” The live video was recorded by 19 video cameras and 10 still cameras. Creative Technology provided video equipment and crew, and Very Good Studio created the content. Beyond the myriad of moving lights utilized for the event — which included Martin MAC Vipers, Robe Robin fixtures and Claypaky Mythos 2 and Scenius Unico units — were three 150-foot-long wavy sets of light arrays of kinetic winches and LED orbs hovering above the audience. These were kinetic spheres provided by Glow Motion and managed by Mike Robertson. “Essentially each one of those orbs is an a wireless RGB color changing device which was on the end of a high-speed cable winch,” explains Featherstone. “That was a whole kinetic sculptural piece that moved and ebbed and flowed.” The winches had 60 feet of travel space, which allowed them to be lowered right above the audience’s heads at one point, and soar into the rafters the next. Four large vertical trusses upstage dropped in from the video screen for the Maroon 5 concert to give it an edgier rock show feel. When they were in the out position for the Hans Zimmer show, the trusses were angled trimmed about 70 feet up “to do an industrial, brutalist, ‘light-breaking-through- structure’ set aesthetic,” says Featherstone. Three lead designers were involved in the Nu Skin event. Featherstone’s business partner, Chris Medvitz, tackled the awards gala, the business session, and the talent show, with programming assistance from Chris Herman. Brian Jenkins, Maroon 5’s LD, handled that band’s concert. And Featherstone himself designed the Hans Zimmer show, with programming by Dennis Connors. Donny LoDico, director of national lighting for Video West, has noted that his new home company increased their inventory from 100 to 700 heads in the first three months he has been there. “This was our first five-truck gig. Video West was brought onboard for the Nu Skin event for their lighting equipment and to assist with content networking. Michael Marto and Featherstone were thrilled to create the Hans Zimmer experience for Nu Skin; this production was a “bucket list” item for both men. ‘We wanted to create something that expanded from Hans’ touring show to a show designed for large scale private events.” explains Marto. “We worked very hard to secure rights from several Hollywood studios to use content from many of the movies he scored.” Thus, a visual montage of Zimmer-scored films, original content, and a live cast accompanied the set.